I’ve found it hard to start Christmas shopping early enough since we’ve lived in California, as I mentioned last year. The calendar has crept inexorably towards December 25th, but the urge to pound the streets or cruise websites for gifts has been sorely lacking. In Britain, I used to start the process in September (in addition to Christmas, there are six December birthdays in our family; I need to start early). I think there are two main reasons for this. The first is that the weather is confusing. Surely Christmas can’t be approaching if we’re still able to walk outside in short sleeves? The second is that the food in the supermarkets is wrong. Instead of mince pies, brandy cream and figgy pudding, the local supermarkets stock pumpkin pie, candy canes and cranberry sauce. Instead of mulled wine, people drink egg nog. Pumpkin pie vs Christmas pudding. Pumpkin pie doesn’t scream Christmas to a Brit. How am I meant to know to gear up for Christmas if all my usual cues are missing? It’s a miracle anyone received any presents at all this year. 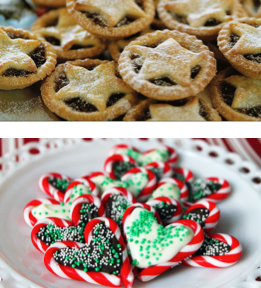 Mince pies vs cookies made from candy canes. I need mince pies to know it’s Christmas.